The Villa is a spacious, modern 2 or 3 double bedroom and 2 bathroom home with additional sleeping space in the amply-sized mezzanine. The open-plan lounge, dining and kitchen area is complimented by an outdoor dining and living area under a traditional thatch roof. 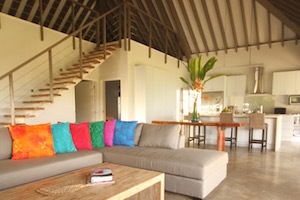 The Villa can accommodate anything up to 3 couples and 7 children. 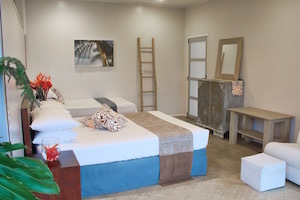 The Villa is serviced daily at no extra charge. 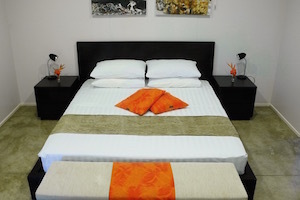 King size bed with deluxe mattresses and pillows in bedrooms. Additional single mattresses or a cot available on request. 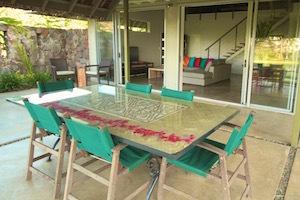 The Villa has a comfortable, well-appointed lounge/living area with lounge suite, coffee table and TV cabinet. 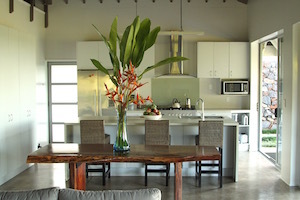 The Villa has a fully equipped kitchen with full-sized fridge/freezer and oven and breakfast bar. The Villa kitchen contains a commercial gas hob and electric oven, microwave, toaster, food processor and pie maker. 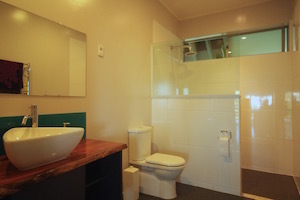 The Villa has a large, deluxe bathroom with vanity, shower, toilet and hair-dryer. The Villa has an undercover outdoor table and seating for 8 people.